This seminar for the teacher shows you how to incrementally teach the writing process to your students. It is a 2 day seminar presented on 6 DVD’s. You do not need to watch the entire seminar before starting, just watch a disc and begin teaching right away. The program comes with a seminar notebook containing writing helps and sample lesson plans as well as three bonus DVD’s presenting the first lesson to students at various grade levels. Use this program to learn to teach writing from second grade through High School. Satisfaction guaranteed or your money back, unconditionally. » New! Tips and Tricks! This video seminar is our primary offering for teachers and parents presenting a system of structural models (narrative, essay, report, etc.) and stylistic techniques applicable for students of all ages and aptitudes. This seminar explains the why’s and how’s behind the Student Writing Intensive. Unlike many creative writing programs, this more classical system stresses modeling and builds a firm foundation of specific skills. As students practice each format and master each technique, they develop confidence - and consequently creativity. Even the youngest first grade student can get a sense of structure and a repertoire of style; high school or university students will see instant improvement in their written communication. This program allows for easy customization, implementation, and concise grading. After learning it yourself, you will be able to communicate to students exactly what is expected of them, as they master new skills one step at a time, and assignments can be integrated with content areas of history, geography, science, religion and literature. The set includes the full teacher training course on six DVDs (12 hours plus practicum assignments), along with three 2-hour demonstration lessons showing the first step of the process being taught to students at three different grade levels - an enjoyable jump start with Structure and Style. The accompanying Seminar Workbook becomes your syllabus and teaching manual. Teaching Writing: Structure and Style is easy to implement. Simply watch the first disc of your teacher’s seminar and then present that lesson to your student. The Seminar Workbook has sample lesson plans and ideas to help you. Once you and your student master the material from the first disc, watch and teach another. To aid you in the teaching of the first lesson, there are student workshops on DVD included in your teacher’s program. 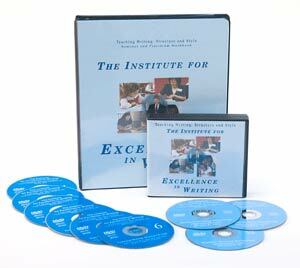 For more student DVD’s, see the Student Writing Intensive. You will learn how to teach your student to outline and summarize, add style to their writing, create stories, produce reports, write critiques, develop essays, and put into writing the information they have hidden in their brain. In this way you can have your students write about what they are learning in history, science, and literature. Included with this seminar are three student workshops. Each one shows Andrew Pudewa demonstrating the first writing lesson at each of three levels. (Note: for more in-depth modeling of teaching through the entire syllabus, see the Student Writing Intensive and Student Intensive Continuation Course). Teaching Writing: Structure and Style prepares the teacher to teach writing to all grade levels. Teaching tips and recommendations are provided within the units to help you individualize each unit to meet the needs of each of your students. For more information on IEW’s philosophy of teaching writing, check out our newsletter articles. Teaches students to make a "key word outline," preparing them to be freed from the problem of what to write about so they are able to focus clearly on how to write well. Builds on Unit I by showing students how to summarize their notes and improve their writing with descriptive adjectives, adverbs, and more. Shows students a basic story structure and develops their ability to write stories using familiar stories as models. Prepare students to take notes from their sources and write library research reports without pain and agony. Uniquely taps students' creative energies by writing stories from a series of one to three pictures. Gives students a method to "get information out of their brain" to use when writing anything, from those summer vacation essays to a decent letter to Grandma. Provides students with the skill of writing formal essays of five or more paragraphs, developing the foundation for high school and university writing. Concludes the course, teaching a solid structure for book reports, reviews, and critiques. If you would like more lessons like the Student Workshops, get the Student Writing Intensive. With its added FREE lesson plans, teaching writing couldn't be easier. If you purchase the SWI along with the TWSS you save $29 (See the ). If you would prefer Theme Based lesson plans, there are many to choose from. We also offer a plethora of supplements, many of which are reproducible, available to make teaching easier. This 2 hour supplemental DVD provides even more ideas for teaching through the nine units. After seven years more years of teaching the seminar and dialoging with teachers, later and with many new insights, Andrew offers new insights and clever ideas, pointers and encouragement, all guaranteed to energize your teaching. These discs are a great supplement to Teaching Structure and Style, whether you are just starting out or have been teaching with the program for years. "My 5th grade son is my reluctant writer. I am AMAZED at his response to the program. Having an "original work" from which to begin has set him free from the paralysis of not knowing what to write, which has produced many, many tears in the last few years. He is now motivated by "mediocre" fiction as a starting document, to "do better than the original"- a competitive boy thing I gather- ha." "One of the best investments I have made. I am very enthused with the potential of this material to vastly improve my children's ability to write. The money spent to attend the seminar is one of the best investments I have made in curriculum in the eight years I have been home schooling." "Just a short note to let you know I have used the dress-ups and sentence openers at home after attending the video series. They have not only improved my children's compositions but have also sparked a new interest in writing. FABULOUS! All parents should take this seminar." "...for the first time in our home school experience, we are actually seeing growth and progress in his writing! The biggest blessing, however, comes from seeing him growing in confidence in a stress-free environment. When my "hands are off content," my suggestions aren't perceived as an attack on his personality. When I am only adding on the "rules of the game" (which is what I call the dress ups, etc.) and adjusting for grammar, I am freed up to be his biggest cheerleader instead of his biggest critic! He seems to like the idea that his isn't expected to come up with it all on his own, and he is receptive to our "modeling." We have already seen changes in his choices of words, editing skills, and creative thought. Thanks again!" I have taught IEW’s writing system to more than two hundred home schooled students for three years now as well as discussed it with many parent-teachers who use it with their own children. The results have been consistently remarkable. When I used to teach high school English (at elite private schools), I expended huge effort discussing aspects of strong writing without seeing results in student writing. From the students’ perspective, no matter how kindly I tried to couch my comments, returned papers carried with them the meta-message: “This is what you should have done to get an ‘A.’” One of the keys to IEW’s success is that it holds students accountable for very common sense organizational and stylistic techniques. They know in advance what is expected of them to earn an “A,” and they are empowered with concrete tools to use to achieve that goal. the formula, partly because there are built-in levels of complexity to most of the stylistic tools. I have seen this time and again in student writing, but I don’t know that I would have believed it if I had not seen it work. The topic/clincher rule is an excellent case in point. It states: The topic sentence and the clincher sentence must repeat or reflect two or three key words. We also require students to bold or highlight those two or three words. Other writing systems ask students to end body paragraphs where they began by reiterating their main point, but by highlighting their key words, students are held accountable. This forces them to grapple with their topic ideawhat are they actually focusing on in their paragraph?and keeps their attention on their main idea, which discourages paragraphs from wandering off topic. A related reason for IEW’s success is that it empowers students with confidence in their writing. I have had several naturally strong writers express enormous gratitude for the system, for teaching them to understand what makes their writing successful and for giving them models to use for any kind of writing assignment. One senior I taught, a talented writer who nevertheless lacked confidence in his own ability, rejoiced after visiting colleges and looking at the writing assignments college students faced. When he returned, he told me he understood now how to apply all the IEW models to those kinds of assignments, and he was excited because he knew he could handle college-level writing. A year later his father sent me an email complimenting IEW. Apparently the young man’s history professor had singled out one of his papers, reading it aloud to the class, as an example of how to write papers. His father said they credit IEW with his success. Another objection I’ve heard voiced is that IEW’s system is complicated and intimidating to parent-teachers. For those insecure about their ability to teach writing, this often seems to be the case. However, I have talked with many parents who took the plunge anyway and were grateful they did. When parents realize they do not have to watch the whole series to get startedindeed, I do not recommend that they doand that they can take it one unit at a time, trusting that the system will get their children where they need to be by high school, they realize the program is not as time consuming than they initially think. Of even greater help is the student-directed series (SWI and SICC), which teaches the same concepts as the core program (Teaching Writing: Structure and Style) but to the child directly and comes with lessons parents can use. Many parents start with this then discover that after using the program for a year, it is effortless to continue with the core program. Once you’ve taught one of the units one time, it’s so much easier the second time through. This also allows writing assignments to work across curricula, applying the models to what students are studying in other subjects. The program is more expensive than most writing programs, but since you use the same system year after year without further outlay, the cost evens out. It also comes with a 100% money-back guarantee with no time limit, so it’s virtually a risk-free trial offer. Pamela received her Masters in English and ABD from Vanderbilt University, where she taught freshman composition courses as a graduate student. She has taught high school English at private schools and worked as a freelance copy editor for several publishers, including Thomas Nelson. Currently a home school parent/teacher, Pamela teaches weekly co-op and tutorial classes to home schooled students of all grades through high school using the methods of the Institute for Excellence in Writing. » More Reviews and Testimonies from Teachers, Students, and Parents.